Sumatra – Lithuanian anthem during English lessons and a slow motion drive through the palm tree plantations. Keltas Malaizija-Indonezija kainavo $60. | The Malaysia-Indonesia ferry costed around $60. Malaysian city skyscrapers and serious busy-ness-like faces seemed to bring us back into a civilized world. So getting back into the streets of Indonesia felt like being back to street jungle and nature chaos. Here we commenced our new tempo life. A super slow drive through Indonesian islands of Sumatra, Java and Bali did not happen because of the unsuccessful hitching. Oppositely, this is one of our favorites ones to get a lift. It’s the approach the locals share. There is no need to hurry up. We are lured into this climate and slightly becoming slow motioners too. ‘Stay with my brother’ one old guy cought as soon as we were ready with our visas. Soon we and our non-miniature backpacks boarded a tatty trailer, attached to a lean moped, seeing every pothole as a potential risk to drop down. Pirmoji diena Indonezijoje - pirmoji kelionės pamoka vaikams. Buvome pakviesti į vieną mažytę mokyklą papasakoti vaikams apie savo nuotykius šioje kelionėje. 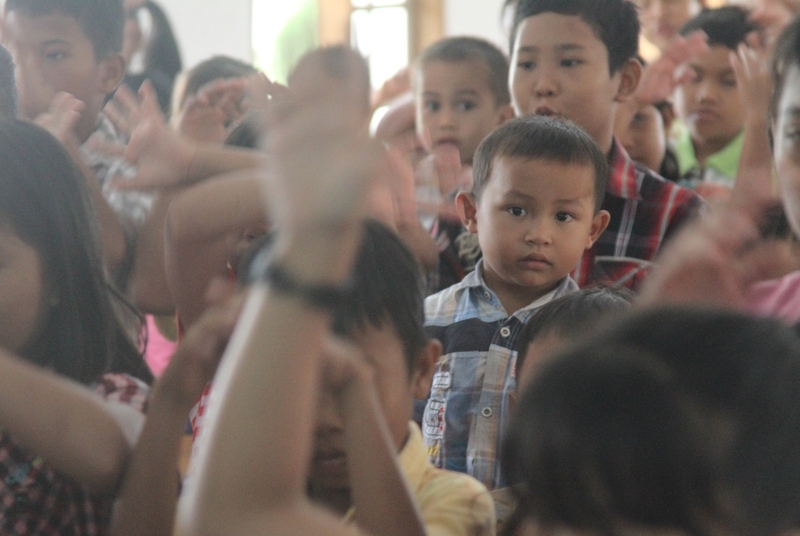 | The first day in Indonesia - the first lesson for kids. We were invited to a small local school to talk a bit about our journey and its adventures. After a humble greeting exchange we got to learn soon that our schedule for the afternoon is tight. Instantly we found ourselves in front of kids and later teenagers to give English lessons. ‘Can you sing your national anthem?’ kids didn’t accept the apology of ‘ehm i have a rusty voice’. Got to stand up and sing it. Then they did their turn. Loudly and proudly they felt so patriotic about Indonesia. ‘How people cannot know the lyrics of their anthem’ 10 year old girl was serious about the case. Mokytoja vedė ritmingus ir visus vaikus įtraukiančius šokius. 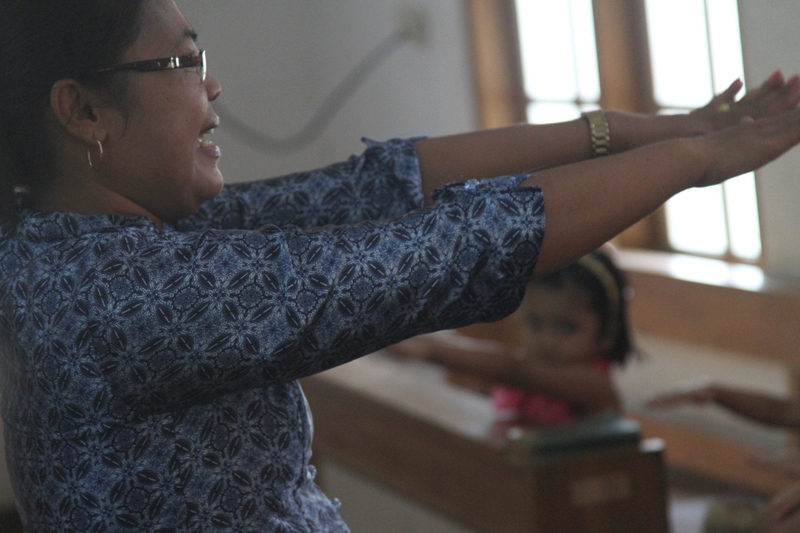 | The teacher was showing the moves and singing songs with the kids. Hitching or ‘numpang’ in Indonesia is an easy job. You don’t need to walk hours out of the town, but raise a thumb, and mostly truck drivers stop and bring you along. So knowing that, as soon as we saw a place to pich a tent, we surprised our driver to stop immediately. There was a catholic church, so the fenced area looked a very good and holy spot to overnight here. Locals later invited us to their homes, but sometimes it’s easier to have your own space. Surely we didn’t refuse a dinner and a glas of home beer of a very bizzare taste. The nearby shop owner told of frequent christian church terrorist attacks, so no wonder why at first they looked at us suspiciously. At night three kids were present to help us along with pitching the tents. The great small inventors soon brought a rock to stick our tent pegs into a hard surface. The crystal clear roof should resist any tropical rain that approaches now every so often. More often. In the morning the neighbours served us with hot chocolate and buns brought straight to the tent. In a moment or two, there was a full yard of kids coming to a service, so playing a football with them gave us and them giggles and a bit of fun. Then surely they wanted us to tell them a little bit about ourselves and oh dear sing in front of the army adventurous-hungry faces. Luckily, kids camp experience solved the situation. You cannot hurry through Sumatra. And so you don’t need it too. The drivers are so relaxed and often take their rest sipping ‘copi susu’ – milky tasty ground coffee, so you do not have any choice. You just swing along cracking banana or some vegetable crisps. So when we finally got stuck for a day in the palm tree plantation, not too far from the factory producing palm oil, we calmly had englishless bodylanguaged jokes with a bunch of same fate drivers. Besikeliant tarp Sumatros ir Java salų prie kranto vandenyje sukiojosi vaikų būrelis, laukiantis kol pro kelto langus kas išmes jiems pinigų. | While on the ferry from Sumatra to Java islands there were few kinds in the water waiting for people to drop money. Our driver doesn’t get calm till he brings us home, and no one minds the renovation process taking place. His wife fries us a mountain of fish, the neighbours gather around to curiously observe us and get a picture or two so the next morning they can show their classmates some strangers. The ferry from Sumatra to Java is cheap, and so we skipping the hitching part (which later on we realise it is still possible in a hopping island process). The water is bright green or blue – it is hard to tell as it changes within minutes meeting a different angle of the sun. So we got used to a relaxed rythm of Sumatra life. We have heard Java, especially its western part is tightly populated, so perhaps we need to switch another kind of button. Mus priėmęs mielas žmogus. | One of unexpected helpful hosts. As soon as we cross the water, the new life begins. We escape the chaos into the internet cafe to plan the next our bit. 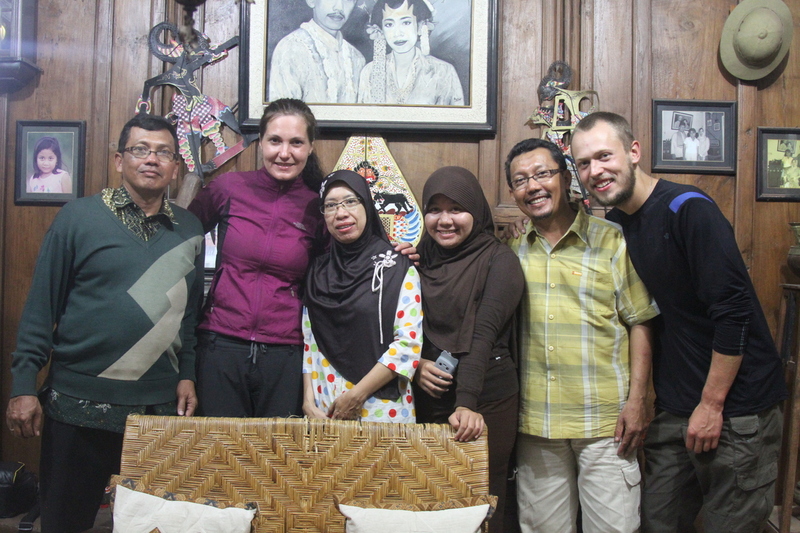 Very soon we get to know a local guy Roshman, who instantly invites us to his home. He does it as he openly admits not because of us (well surely not, he only knows us for couple minutes), but to honour God’s gift. And that is us. Guests. His mom, all humble and pleasant prepares us a cuppa. Roshman gives a brief account of why and how he has got faith in God. He could not do it, if Islam was not logical he admits. I can see the logic in Mohammed’s teachings. If the science eventually proves something, it’s all been adviced or found before in islamic teachings. One day the driver brought us to the railway station, and we got curious whether hitching the cargo trains is still the case in Indonesia. It used to be that some seats existed for the most poor ones, and hitchhikers could use if they were quick enough. Unfortunately this is not the case anymore, and so we just had some paid (seriously cheap) train experience instead. Kelis kartus važiavome traukiniu. Kiek liūdna ir chaotiška patirtis. Daug triukšmo, šiukšlių, valkataujančių žmonių ir prekeivių. | Fre times we tried an indonesian train. It's a bit sad and chaotic experience. A lot of noise, rubbish, beggars and vendors. When we boarded the dark slightly terrifying train, the floor was covered with a thick layer of the mushy fruits, bottles, and scraps. The seats are all facing each other, so you cannot avoid a communal ride feeling. As soon as the train begins to move, the life commences. The vendors circumnavigate the train offering all sorts of goodies starting with sweet food, stickers, shoes and clothing, finishing with the opportunity to fill your lighter. The second wave is the beggars, which some of them seem to be genuinely disabled, but some younger ones use it as a way to earn their living. Then a non stop string of musicians offering a kitch to rock music. The noise gets to an impossible extent. The train stops. The noise disappears. It starts moving, and the small child goes swiping the floor waiting people to pay for his job. This practice is certainly intercontinental as you may find it in Moscow, La Paz or Nairobi. This is always a test to your consciousness, or… logic. You may feel well giving some pennies to a poor little child, but it may have a disastrous consequence. The kids don’t usually work for themselves, they are a part of a streetbeggars mafia net. The more we travel the more we understand that wealthy tourists wanting to calm their consciousness and give a tenner to a beggar in fact does no good. Maybe for another day. 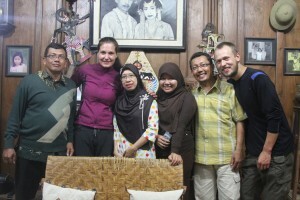 You can immediately get the feel of cultural and educational centre of Java, and possibly Indonesia too. The students sitting till the night playing music and chatting. Two of the most valuable and famous sightseening places. The range of universities and musuems, all is there for your interest. 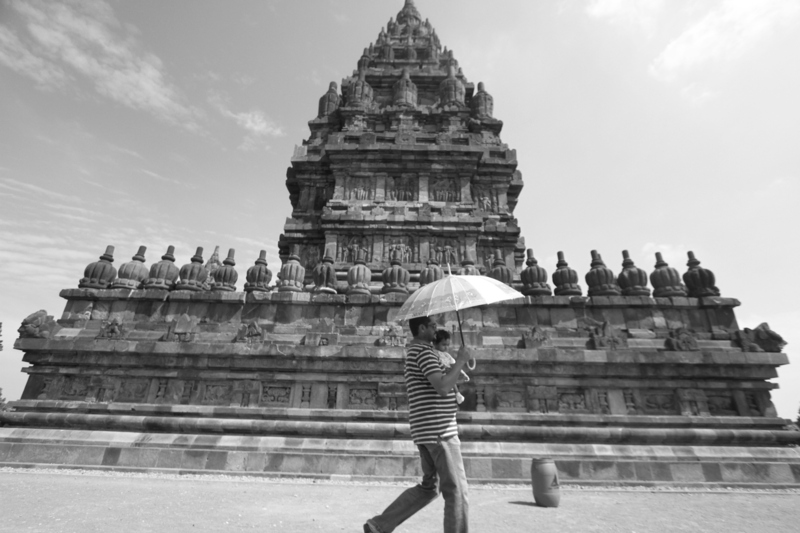 We choose Prambanan to feed the cultural hunger. It’s expensive. We close our eyes, calculate our budget and decide to enter it. This temple is one of those artchitectural wonders. The only thing is you have to put up with tourits. Throughout our journey we turning into some sort of savages trying to allienate ourselves from organised people who follow umbrella and turn their heads and ears upon the command. We sense the masks and a cheat from the locals trying to present their cultural values. This artificial approach may be of some value for some, but it only creates a distance in our world. Svečiuose pas mūsų draugą, kolekcionierių ir šiaip labai išmintingą draugą. | Visiting our intelligent friend's house. Just before deciding which crater we are going to attack, we unexpectedly hitched a local person Adhi, who was just going to give a lecture to a local group how to make their community work better. He soon invited us to his home, which turned out to be nearly a museum instead. The items around his dining hall looked like they stepped down from some colonial times (which in fact they were). Cameras, sewing machine, calculator, shaddow puppets, cooking utensils. Even our bed was like from a retro movie. Coconut juice in the morning, and his advice to go to Bromo. He is an outdoor instructor during the weekend, so he know what he is talking about. The trip through the western part of Java is one breakless town. The noise, the kind but overwhelming attention and the lack of sleep tire us out, and we look forward to get to the nature. The eastern part of Java slows down the rythm. We get to the town up near Bromo, but have no intention of joining the crowd to visit this nature wonder. We reach the desert looking plain with a few ereceted vulcanos, and go against the torrent to pitch the tent somewhere closer to it. The silence falls, and the noise still ringing in our ears soon fades away. Žygiuojant pro dulkėmis nusėtą dykumą. | While hiking on the dusty desert. In the morning we wake up later than planned but right before the sunrise. We are far way from the roaring crowd trying to wake up sun with their maddenning screams. We have our own top of the canyon, a Cinematic Orchestra tune and surely the impressive paysage in front and behind us. The top of our liberation feeling is a wild dance when the sun is up. We are so happy finding our corner. So climbing up the crater was one of those unusual hikes too. Our own path, our own hardships, and our own corner of the crater. We get up high, and our jaws drop down. This living mountain spitting white clouds and boiling sulphur feels like a living animal. You don’t want to mess with it. 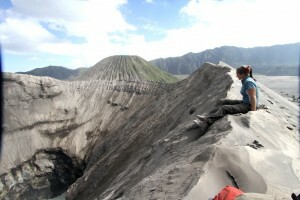 Ant Bromo vulkano krašto, žvelgiant į burbuliuojantį pragarą. | On the edge of the Bromo vulcano looking down the boiling hell. We walk along the sharp edge. The wind blows tiny particles which we cannot call sand. It all feels a bit magical. And to extend that off the beaten track experience we walk down through some river washout beds. Some of them high and steep to a level we need to use the ropes. In that manner we use it for the first time, and truth to say it was a spine chilling experience, with the hardest bit of it – to ‘let go’. A chill out evening to calm down adrenaline, and we move on towards Bali. In fact, to hitch a vehicle from the very touristy place appears to be possible too. Just we were prepared to sit on the sides next to the motorbikes. All the way down the turns left and right. Our patient drivers held us in the cabin till the ferry. And so we got into it for free. So after all, the island hopping for free is possible too. You only need to stay with the drivers, and then no one is going to check the tickets. Prie vandenyno. | Near the ocean. The atmosphere changes immediately upon the arrival to Bali. The few statues of hindu deities increase into vast amounts hidden and openly displayed in small towns, jungles or near the beaches. No wonder why our faces are glued to the window. As we wanted to spend some time near the ocean too, our drivers were not surprised why we wanted an immediate stop when we saw a beautiful place. We thought it was an accidental place to see a bit of ocean water. We got surprised to see a quite neglected but nevertheless beautiful temple straight on the beach. We very soon dive into the high waves, and wash down all the heat. Going to Denpasar with a small truck we are enjoying the fresh views of jungles and the beauty. Our trip is nearing to an end. 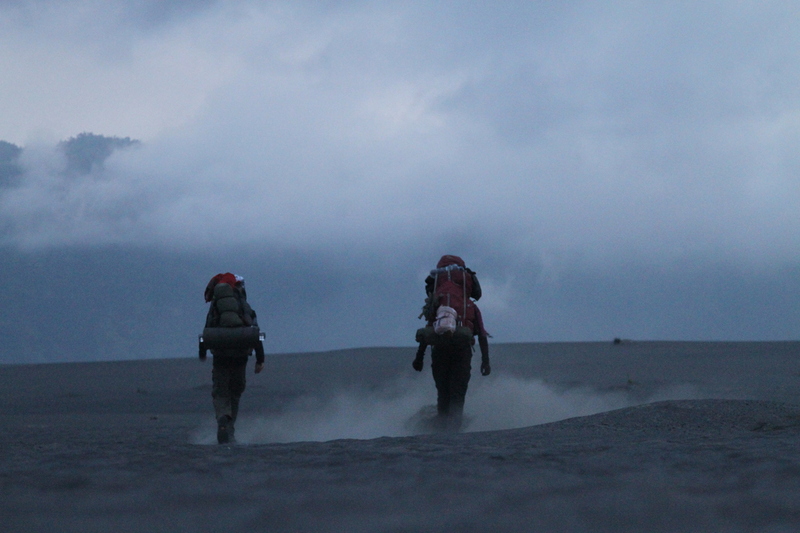 Despite the chaos and fatigue, this journey through Indonesia was one big adventure. Skrydis į Pertą. Australija. $100. | Flight to Perth. Australia. $100. To the airport – bear in mind it was the only possibility to get to the new continent – we arrived surely too early. Like savage kids we feel a bit strange to the tourists marching around. We need our corner. So we rush out to the beach which is not too close, but close enough to be able to spend an afternoon there instead of catching breath in airport. The sunset, departing and landing airplanes, ships on the waves. It’s a good place to say goodbye to one stage of our trip. We can only share our humble experience bearing in mind we don’t use hostels. It’s a country around or exactly on the equator so you can only imagine how hot it can get at times. Frequently was not possible to sleep inside the tent, if you wanted to breath. Locals would warn you of the snakes too, even though these animals are pretty fearful creatures. But still we found that the best experience is to find a shed which always is lifted a bit on poles. If you go with drivers, they will use those sheds too. So you are sorted. Otherwise we also used the places like sheds which in the daytime been used for selling fruits. We always used the mosquito net outdoors to prevent annoying and malaria bearing mosquitos. 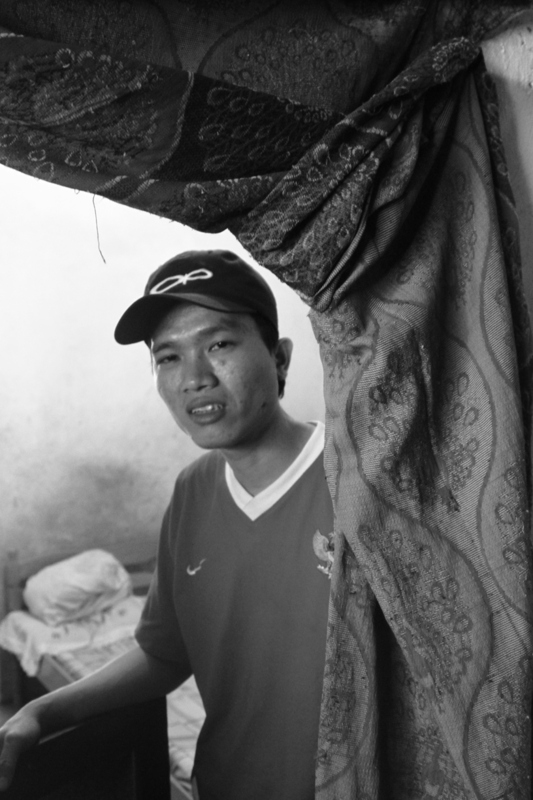 Indonesians by the way are very hospitalble people, so very likely you will be invited home too. And you will be thanked for that as well. It’s a pleasure to hitchhike here. Some drivers will even know some English, but otherwise they all mimic as they are actors. Using the full potential of body language. Most probably the truck drivers will take you on, but then you are sorted for days and you don’t need to worry about getting stuck in that unbroken chain of towns i.e. Java island. But if you don’t use the highway you will go slow. We mean it. The roads are awful, the drivers will use frequent opportunities to have a ‘copi susu’ (coffee with milk). The patience will be rewared with breakfasts, dinners and lunches, and they won’t let you pay for any of it. To eat in Indonesia is a full pleasure. The islands are surrounded by waters, so the fish meals are fresh, cheap and delicious. The cheapest meal we got were 2 portions of fish, veggies and rice for 1.5 dollar. Kopi susu (fresh grounded coffee with milk wont cost you more than 50cents, often much cheaper. Fruits are exotic, so you eat it while you can. This is one of the countries where the sweat freely flows down. So the higiene question is certainly very important. Fortunately being a Muslim country, they observe their cleanliness thoroughly. Hence the showers – or buckets, basins of water with plastic cups are everywhere and everyone is taking ‘a shower’ as soon as they can. Some options are romantic – tin walls and palm tree above your head. We drink only bottled water, and so we brush the teeth with one as well. So far had no health problems. 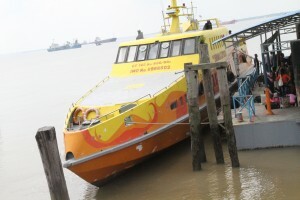 Traveling from Malaysia by ferry bear in mind if you don’t have a visa and want to make one on arrival you should go to Dumai port. Visa is 25$. Sometimes they ask for the departure tickets in order to make visa, but they did not ask us to do it. Hitchhiking – numpang (if you say this magical word, it all becomes clear as Indonesians know pretty well the concept of hitching).